Are the Jews “Poisoning the Wells” Again? 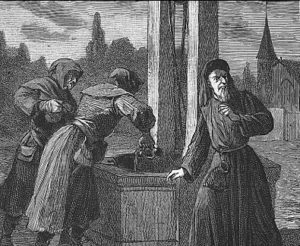 The Dark Ages were a difficult time of history for much of the world and they turned out to be quite a bit darker for the Jewish communities of Europe. The chasm between Christianity and Judaism continually widened. Early theological differences had morphed into the social ostracism that would eventually lead to the racial antisemitism that allowed for the Holocaust to take place. A wedge seemed to be irreversibly pushed between Christians and Jews. People looking for reasons to hate the Jews didn’t have to look very hard. A myth had developed in the early 1320s that the king of Tunisia, some lepers and the Jews had conspired together and were determined to destroy Christianity. Apparently, they had concocted a magic recipe for a poison made of lizard, spiders, frogs, human hearts, urine and sacred hosts. The legend of the poisoning of the wells of Europe was emerging and once again the Jews were about to be held responsible. With the mid-1300s advent of the “Black Death” or “Black Plague”, the world was about to experience death like never before. It was the most devastating pandemic in the history of mankind, from 1347 to 1350, that was responsible for the death of about 75 million people worldwide (25 million in Europe alone.) It is now believed that it was caused by a bacterium found on fleas carried by black rats from Asia onto ships sailing to Europe. It would take 150 years for Europe’s population to recover, while other minor plagues hit Europe until the 19th century. Jewish people also died during the “Black Death”, but generally in much lesser numbers. Many reasons can be at the root of the smaller number of casualties. Firstly, the Jewish people lived in somewhat of a communal isolation from the rest of the Christians, which, to an extent, allowed them a safe distance from infected areas. Secondly, the mandatory liturgical washing of the hands before meals was sure to help with hygiene. Finally, the strict kosher laws that religious Jews were bound to follow, forced them to maintain a stricter hygiene as well, and thus resulted in less death in the Jewish communities. While the reduced number of Jewish casualties could partially be attributed to Jewish customs and kosher laws, it didn’t stop the masses from slaughtering and destroying over 200 Jewish communities, numbering Jewish fatalities in the tens of thousands. Apparently, Mr. Oborne witnessed Israelis poisoning Palestinian wells, but to further validate his unfounded claim, the Daily Mail came to his rescue. The original statement made by Peter Oborne didn’t include the phrase “according to a number of respectable sources” later added by the Newspaper editorial staff , making the staff as guilty of antisemitism as the columnist. One wonders if the Dark Ages ever came to an end for the Jewish people? It is difficult to fathom that people in the West would continue to spread canards against the Jews such as the poisoning of wells. It is even harder to believe that people will accept this as a verified news and in their own mind, join the enemies of Israel in further ostracizing and demonizing the Jews. Satan hates the Jews because God loves them. His twisted creativity has no end. As he sees his end coming soon with the return of Yeshua when all Jewish people call upon Him (Zechariah 12:10), he will double his efforts to stop the Jews from calling on Yeshua. 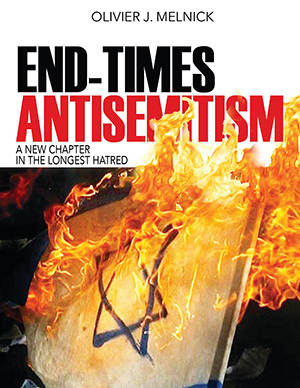 The most irrational libels against the Jews will be believed by many. The poisoning of the Palestinian wells is just one more example of Satan’s devious agenda to destroy the Jews.